Any drop could be your last. Back in September, I saw Penumbra, a film a lot of people were jazzed about since it was directed by Adrián García Bogliano, an Argentine director who has cranked out a lot of low budget horror movies over the past eight years. I didn’t completely take to Penumbra, but I admired certain aspects of it (particularly its suffocating setting), so much so that I was excited to see Dark Sky finally release Bogliano's previous film, Cold Sweat. Bogliano referenced Cold Sweat in his Q&A session after the Penumbra screening and mentioned that it was also an apartment-bound horror movie, so I was intrigued in it as a companion piece of sorts. This one is set at a different apartment complex, one that’s a little bit more ramshackle than the one in Penumbra. Our two leads (Facundo Espinosa and Marina Glezer) have traced an IP address to this building in their search for a missing girl; despite this being an obvious setup for a horror movie, the two begin to investigate. Inside, they find a bizarre house of horrors being operated by a couple of old men who have apparently spent their entire life torturing and experimenting upon victims, and our two main characters could be next. Oh, and the two guys have a penchant for smothering said victims in nitroglycerine. Most of the suspense in Cold Sweat is derived from this, as one false move could leave everyone splattered all over the building. We get a glimpse of this early, when Espinosa stumbles onto the first bizarre scene within the building, where one of the guys is interrogating a girl; before we know it, head suddenly explodes in one hell of a jolting moment that lets us know all bets are off. Cold Sweat has a fairly vicious mean streak to it that butts up against its somewhat bizarre story--it turns out the two guys are former Argentine revolutionaries, so there’s some political undercurrents guiding things. We’re still kind of left in the dark a bit, though. The two antagonists are really a couple of oddballs; both seem to frail and grandfatherly, which is probably what makes them a bit terrifying. They’re constantly lamenting the state of youth today (mostly because it makes them work harder to lure their in their prey) and reminiscing on their glory days when they aren’t bickering like an old married couple. They seem to mostly dislike girls, at least if their choice of TV programming (some vintage old show spewing male-supremacy rhetoric) is any indication. It’s odd that these two have essentially turned their apartment into a time capsule, as if they’re still living in a fantasy world where they’re revolutionaries, with the irony being that they’re now just old guys stuck in the past. That’s a pretty keen statement, I think, and it’s not one that indicts revolutionary zeal so much as extremism. I’d hardly say Cold Sweat dwells on this stuff, though; it operates more like background noise against a tightly wound suspense story. The main centerpiece here involves the girl that the two leads were searching for in the first place; they do find her in a bathtub, albeit completely slathered in nitroglycerine. This gives Bogliano the opportunity to make the most mundane tasks into a hand-wringing proposition--emerging from the bath-tub, removing clothes, etc. Bogliano often captures these in close-ups to highlight these moments and turn them into intense, sweat-worthy moment (the film’s title becomes obvious once you see how lathered up our heroes get--both by sweat and nitroglycerine). If all this weren’t enough, the entire apartment is rigged, and the last twenty minutes or so unearth a horde of ghastly discoveries. All in all, I probably regard Cold Sweat in much the same way as I do Penumbra: it’s mostly solid since Bogliano takes some well-trod material and finds some nice, grisly deviations. 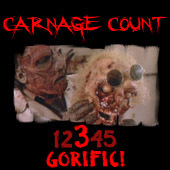 His material is well-paced, mixing in slick gore gags with intense, suffocating sequences. I’d give this one the nod over Penumbra, if only because it’s more consistently riveting instead of slowly burning up to one mind-bending scene. With its political subtexts and unique villains, it subtly sets itself apart from the pack of other psycho-killer movies: think of it as The Wages of Fear by way of a mad scientist slasher. Cold Sweat was a festival darling for the past year, and Dark Sky has brought it home to a features-laden DVD that includes deleted and extended scenes, some behind-the-scenes looks, easter eggs, a poster gallery, a comic book, promotional material, and a commentary with Bogliano. The presentation leaves a bit to be desired, though, as the transfer sometimes exhibits jaggies that other artifacts that don’t do much favors for the film’s already dim and harsh digital look (oddly enough, I recall Penumbra having the same problems). The Spanish 5.1 track fares much better, at least, as it’s very loud, aggressive, and rumbly (whenever the more intense sequence set in, they’re greeted by metal riffs). So far, Bogliano’s material has yet to completely wow me, but he’s certainly got the eye and the mind for horror, so I’ll keep an eye on his future projects; if nothing else, though, both Penumbra and Cold Sweat have made me afraid of Argentine apartment complexes (even though they’re apparently full of gorgeous women). Rent it!